Come and see what God has done, how awesome His works in man’s behalf. 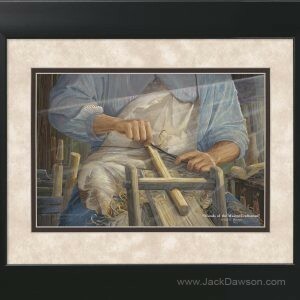 The hands of a master craftsman are patient and deliberate, as well as strong and skilled. 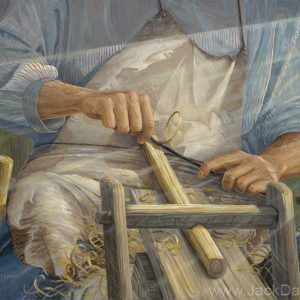 But look carefully at these hands-they’re the hands of the Master, skillfully crafting His destiny. Every move has meaning. Even the shaving coming from His drawknife forms the shape of an icthus, the fish symbol His followers will eventually use. Against the dark shadow of His coming death, hands yet unscarred draw the knife along the wood that will become His cross. INRI, the acronym of the Latin “Jesus Nazarene, King of the Jews,” appears on the crossbar of the clamp that holds the wood and forms a cross, foreshadowing the inscription on Calvary’s tree. 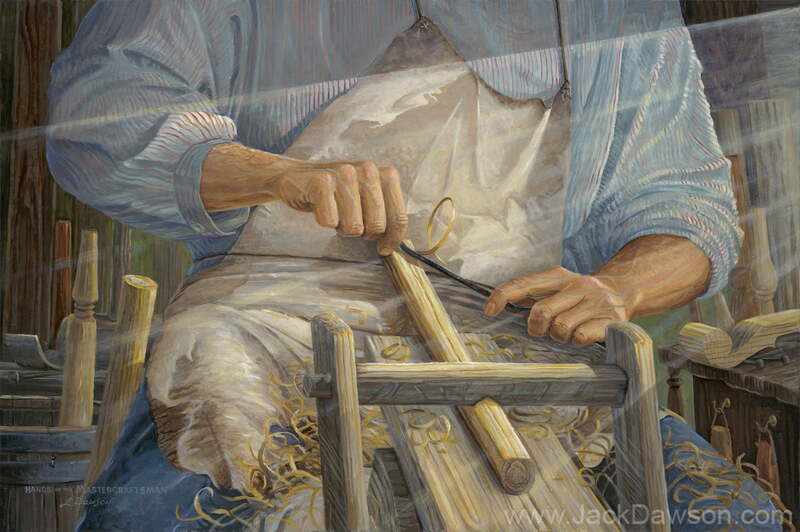 The red stripes in the Carpenter’s shirt foretell the stripes He will suffer and the blood shed for our healing. His sheepskin apron speaks of His sacrifice as the Lamb of God. The map imprinted on His apron assures us His sacrifice will be for the sins of the whole world. The workshop is filled with wood of various kinds and shapes, suggesting the many peoples and races for whom He will die. Three spikes are prepared to nail Him to the cross He so lovingly shapes for our salvation. The presence of the Holy Spirit shines across His work, reminding us that Christ is the light of the world and the guiding light in the believer’s heart. 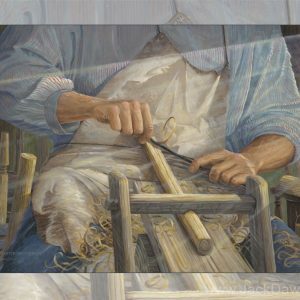 The Master Craftsman calls you to take up your cross and trust Him as He shapes your life into the person He wants you to become.